Mezzanines available now. Please call, or send us an email, for pricing and availability. Our Inventory changes frequently. Category: New & Used Mezzanines. Tags: mezzanine, used, Yankee Supply. Turn your unused space into a productive storage area. Variety of sizes and material available. Give us your area specifications and we can build the mezzanine that is right for your area. We can assist you with the layout and provide a CAD drawing of it for you. We have the ability to send our installation crews anywhere in the country to help you install or dismantle mezzanine systems, and can provide stamped certified engineering. Start out small and add to it as your business grows! 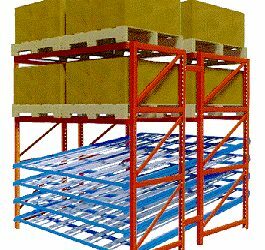 Popular types of mezzanines are: Clear Span, Rack Supported, and Shelf Supported. Stairway and Landings: Yankee Supply can provide both OSHA and BOCA stairways for your mezzanine. Our fabrication division can build you a stairway or we may have a used stairway that will fit to an existing mezzanine that can save you money. We also have used landings and stairways for applications when the stairs need to run alongside. Guardrails and Kick Plates: Yankee Supply can provide used mezzanine hand railing and kick plate. We have thousands of feet of used hand railing and kick plate for your mezzanine application. All hand rails are built to meet BOCA requirements. Gates: A lift out gate can help. Have a section of your hand railing built so that it can be lifted or swung out of the way so that there is an open section. Pallet loads can be easily lifted and placed with a forklift. A permanent vertical lift can also be placed at the base that lifts material to the lift out gate section. Decking: There are few options for decking. There is solid deck that is generally corrugated steel with a plywood surface and there is also plank decking and bar grating. Call us today to discuss your best floor option based on your application. Used mezzanine that we custom fit with our fabrication abilities.